Everything you need to know to become a patio heater expert! 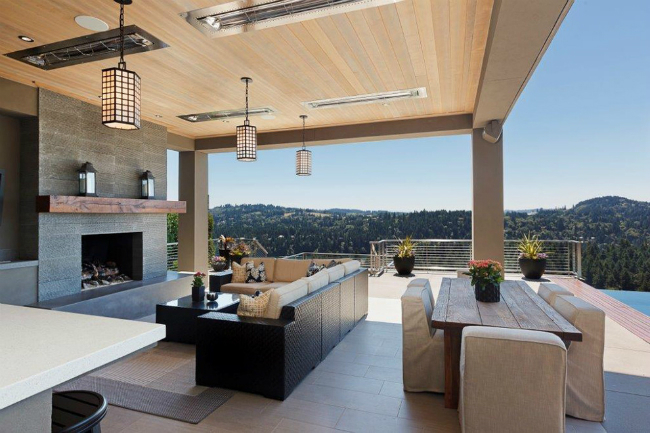 Patio heaters are outdoor appliances that use a method of heat transfer, called radiant heat, to warm up the objects around them. Radiant heat produces waves of energy that become heat when they touch a solid object. 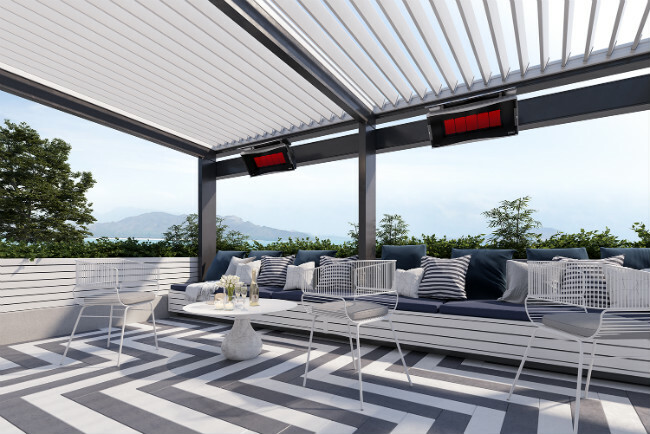 Since radiant heat is transferred directly to a person or object, the warmth created won’t get carried away by the wind, making it the most efficient way to heat an outdoor space. A perfect example of radiant heat transfer is the sun. Think of standing outside on a bright sunny day and letting the sun warm your skin, or sitting on the ground and feeling the heat radiate up from the Earth. Whatever solid objects are in the path of the sun are warmed by its rays. 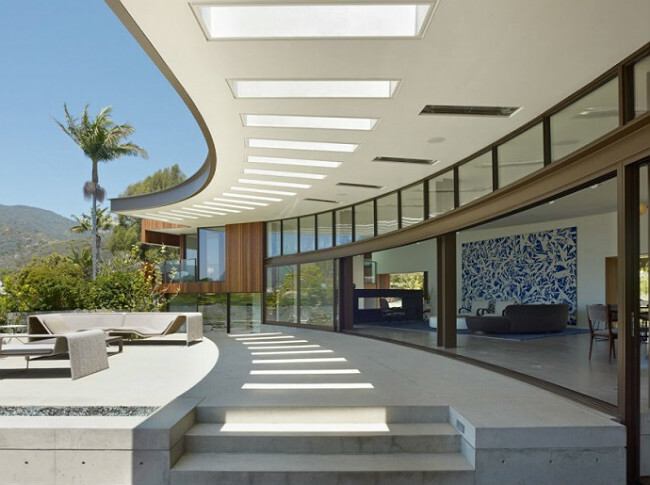 Patio heaters function in the same exact way. Patio heaters often come equipped with a reflector panel that is a curved or dome-shaped piece of metal that sits on top or behind the heating unit to reflect heat to the surrounding area. 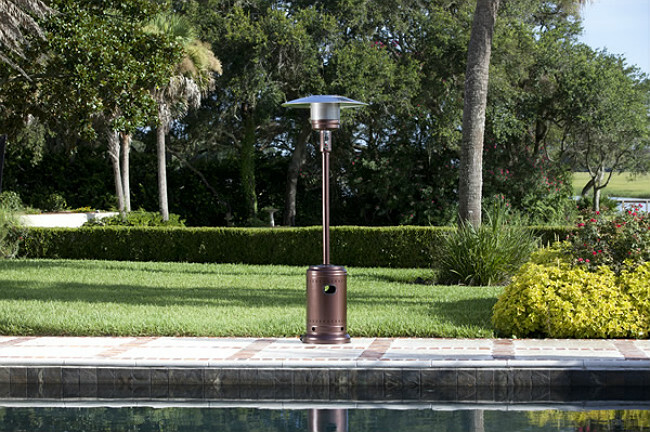 Patio heaters are available in two different fuel types – Gas and electric. Gas patio heaters can either be fueled by liquid propane or natural gas, while electric heaters only need an electrical connection. Portable propane patio heaters use a liquid propane tank as their fuel source and require very minimal installation to set up. Once the heater itself is assembled, you simply need to attach a propane tank to it, check for leaks, then turn it on. 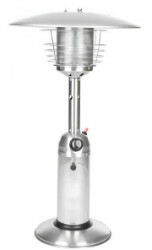 Portable propane heaters give you the freedom to move the heater wherever you need it most. The propane tank is conveniently housed inside the base of the heater, hiding it from view and allowing you to easily move the heater from place to place. Mounted propane patio heaters won't interrupt the flow of your outdoor room! They provide plenty of warmth while staying up & out of the way. Wall/ceiling mounted propane patio heaters require a permanent gas line to connect the heaters to a large, residential or commercial propane tank. The gas line will need to be installed by a licensed professional. Gas patio heaters should not be used in enclosed spaces. Avoid using them in high-wind areas and don’t place them near combustible objects, like low-hanging trees or plants. Before installing gas patio heaters, check the owner’s manual to find out the manufacturer required clearance to combustibles (how close they can be placed to things that catch fire easily) to determine the right size for your space. Natural gas patio heaters can either be ground mounted or wall/ceiling mounted and connect to a permanent gas line. They never run out of fuel and are simple to maintain. Installing multiple patio heaters will provide an even distribution of warmth throughout your entire space. If a natural gas line isn’t already available, you will need to hire a professional to install one. This may cost more initially, but once installed, natural gas heaters typically cost less over time when compared to propane heaters. Electric patio heaters don’t require ventilation, so they can be used in both indoor and outdoor spaces. They are very efficient and produce zero carbon emissions and greenhouse gases, making them the most environmentally conscious choice. Flush-mounted electric heaters will blend seamlessly with your surrounding decor. Electric patio heaters come in both free-standing and mountable styles and are the simplest option to set up. Some electric heaters can plug into a standard 120 volt wall socket, but most require higher voltage so they can produce a greater amount of heat at once. Electric patio heaters don't need ventilation, making them the perfect choice for indoor/outdoor spaces! For heaters that need higher voltage, you will have to have the wiring professionally installed. Patio heaters are a great way to heat your outdoor space safely and effectively. They come equipped with safety features like a tilt shut-off valve. A tilt shut-off valve is designed to automatically shut off the heater if it gets knocked over. For the safest options, look for patio heaters that are UL approved and CSA tested. These approvals ensure each product has undergone vigorous testing to verify that they are a reliable and safe heating appliance. Always consult the owner’s manual before choosing the location for your patio heaters to make sure there is adequate space between the heater and any combustible materials. Free-standing patio heaters should always be placed on a solid, stable surface, especially if you live in a windy area. Never leave patio heaters on unattended. The power for a patio heater is measured in British Thermal Units, or BTU’s for short. BTU’s tell you how much heat an appliance will provide. In other words, the higher the BTU’s the higher the heat output. Patio heaters are great low-maintenance options to bring additional heat to your outdoor living space. They are safe and affordable alternatives to other outdoor fire products. A wide range of styles are available to fit every space and heating need. Electric patio heaters are the most efficient and can be installed in both indoor and outdoor settings. Do you have more questions for us? Contact one of our NFI Certified specialists at (800) 919-1904 today! 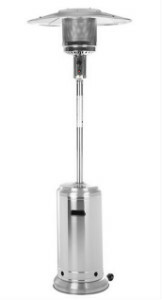 Head over to our Patio Heater FAQ Page for more information on patio heaters. 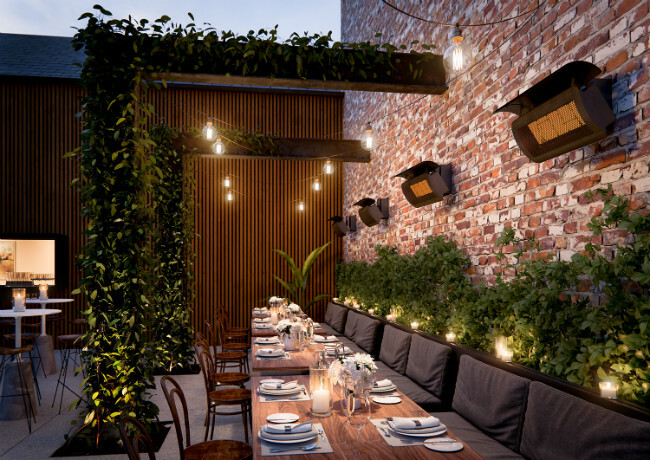 Explore these 7 swoon-worthy outdoor spaces to get inspired to create your own! Is it safe to use a fire pit under a covered patio? Here's what you need to know along with some safe alternatives to heat covered spaces.